dausa is the capital of a small district of the same name. Its history is linked with that of Amber's as it was here that the Kachhawaha Rajputs coming from central India dropped anchor. This happened in 1037 AD, when the Rajput, Duleh Rai, annexed the land from the tribe of Susawat Minas and made dausa his capital city. Later the Kachhawahas moved on to Amber and then again to Jaipur. dausa is named after a nearby hill called Devgiri. 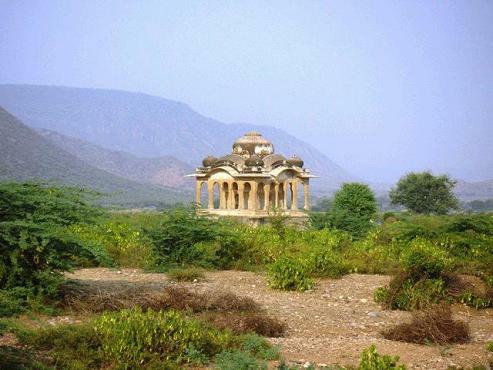 On the top of hill is situated a fort, built by Badgujar Kings, who were the orininal rulers of this place. Later, dausa was given by Chauhans to Kachwahas, but the centre of their power shifted to Amber. When Akbar went to do Jiyarat to Khwaja Muinudin Chistti in 1562, he stayed in dausa and met with Rupsi Baragi, Hakim of dausa at the time and brother of Bharmal. Agriculture is the main occupation of the people of dausa. The main crops of the district are wheat, bajra, rapeseed, mustard and groundnuts. Your dausa travel will begin from NH 11. dausa, a rural city is a cool place to hang around for a day while staying at Jaipur. Just at 54 km east of the Pink City, dausa is an ancient town of archeological significance. It once had the pleasure of being the first capital of the quomdam Kacchawaha clan of Dhundhar. This happened in 1037 AD, when Rajput king, Duleh Rai, annexed the land from the tribe of Susawat Minas and made dausa his capital city. Now it is a silent spectator of the bygone glory with an old fort in one side and small havelis dotted all over the terrain. Recently archaeologists visited dausa and discovered some interesting antiquities, which are believed to belong to the late medieval period. You too should pay a vist to the famous rural destination of dausa that has historical attractions.